Thank you for joining us for the Get Real Wednesday webinar on “Getting the Biggest Bang for Your Buck”. 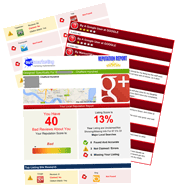 If you haven’t already claimed your free Reputation Report – please do. It will show you what customers are saying about you online – as well as highlighting if you’re not being found and talked about, which is worse! To get your report, just and select your country and enter your business phone number in the form on this page. Your phone number is what our systems will use to search for your listings online – not for anybody to make telemarketing calls! Then here’s your extra special freebie worth £297! As part of our Reputation Marketing strategies we’re producing Review Branding Commercials for our clients. Take a look at the sample video below. These are powerful marketing tools, particularly when you consider that 87% of people who are referred to a business immediately search online to find the company information. Try for yourself. Search for “Outsmarketing Grays Reviews” on Google. The results will open in a new browser tab. See how powerful this is? Because you’re on Clive’s list, and because you showed up for the webinar – I want to give you your very own Review Branding Commercial, highlighting a 5-Star Review or testimonial you’ve received. We’re currently in Beta, getting ready for a full product launch. Filming with UK presenters begins on 18th August, whilst we’re already producing Review Commercials for customers in the US. So I can manage our production time and resources, if you want to take me up on my offer and get a Review Branding Commercial for your business – put your name and email address in the box below now – even if you think you’re not ready, or you don’t have a review to highlight yet. Over the next couple of days, I’ll send you more information of exactly how the process works and what information we need to collect from you so we can produce your video.